Unfortunately our pup won himself another visit to the vet on saturday for an U/S as he still hadn’t improved, and he’s now sporting a lovely sheared belly to prove it. Without a cause for his inflamed bowel diagnosis we had nothing but some anti-nauseant meds and some advice to take him home with. After some great deliberation, and a chat with our dog sitter we decided we would prepare for our flight home and hope for the best. If nothing else we’d come back early but at least Rylie could spend Christmas with our family. For the second time, we checked into the flight paid the baggage fees and packed our bags. We made it through the night, said dog kept his dinner down and we dropped him off at the sitters with his half eaten breakfast. At the airport Rylie was a champ, and she even stayed in her stroller until security. Her parents had to set their OCD tendencies to let her climb all over the airport chairs. Mom drew the line at crawling on the ground however, it was bad enough the chairs looked like they hadn’t been washed in their lifetime and she was licking them. Gasp. Who knows about the floor. We are starting to get this early boarding routine, after 7 flights as parents we realize its actually convenient to have time to get your junk together. This time, Rylie was so entranced with everything on the plane. 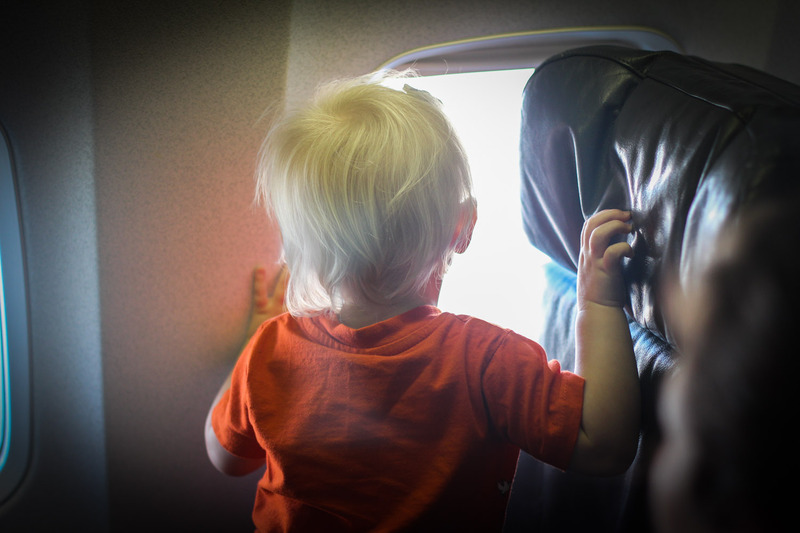 She loved exploring the seats (arm rest up and down, tray up and down), smearing the windows, looking at the neighbours, pushing the seats, climbing on us, smiling at the flight attendants. She watched the planes outside being loaded while we waited, and then the whole take off process was fascinating. She fell asleep on my shoulder for the first time in forever while looking out the window. Unfortunately, her nap was way to short, when she couldn’t get comfortable it was back to busy busy awake and active baby for the next 2.5 hours. We arrived at home to a brown snowless city but at least we made it. The weather was mild and we were happy about that. Rylie took off around Grandmas’ house, crawling, climbing, and of course, stealing things off the Christmas tree. Dinner was a spectacle (without Nixon) and Rylie proceeded to toss her food and make messes from the moment she began. After a lovely dinner with mom, Josh started to set up Rylie’s Christmas present. What is the best thing to get a super climber who won’t sit still? Well, the thrift store slide was just to tide her over until we got home… grandma got her a new All Star Sports Climber to feed her goatly urges. Dad needed the play by play in photos to get things started.